I've been spending some time poring over old issues of the once-great Miami News that are now archived on Google. Perhaps I'm being overly nostalgic, but I kind of wish that today's newspapers were as scrappy and two-fisted as newspapers back in the day seemed to be. Newspapers of old got a lot wrong, but they also got a lot right. But whatever their faults, they certainly weren't boring! And while today's newspapers have to do more with fewer resources, there's no excuse for putting out an inferior product. For instance, Rick, over at SFDB compared the St. Petersburg Times's coverage of the Gulf oil spill to the Miami Herald's coverage lack of coverage of the spill. And while Rick seemed to infer that the St. Petersburg Times was an inferior paper because it's located in what he sarcastically calls "the booming metropolis of St. Petersburg," the rest of his message was right on target. 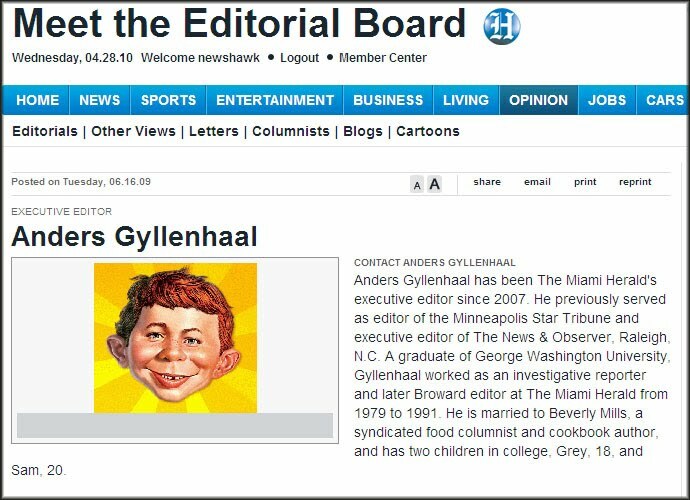 And that is that the Herald - and its executive editor Anders Gyllenhaal - have dropped the ball and let the paper's readers down by failing to cover a major story that could affect Florida and its tourist and fishing industries for years to come. These days Gyllenhaal seems more concerned with sending computers to Haiti. But hey; we here at Random Pixels prefer to think of the glass as being half-full. So while you may have to rummage around a bit on the Herald's web site to find mention of the oil spill; we had no trouble finding this excellent slide show featuring some tasty pics of the Florida Marlins Mermaids! 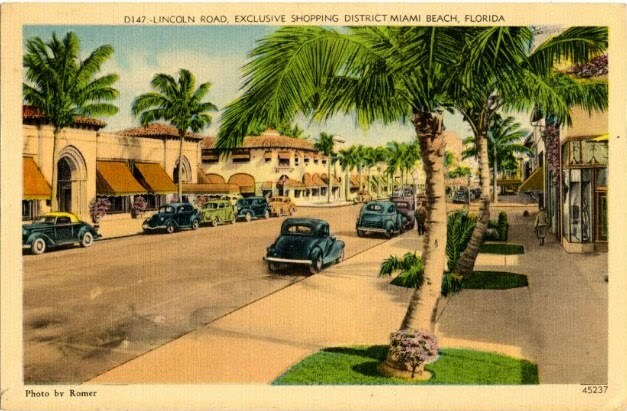 Check out the Antique Market on Lincoln Road this Sunday, April 25. After this Sunday's show, there's just one more show - May 9. The shows will then resume in October. 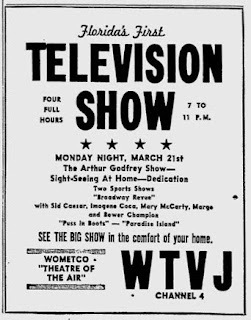 A tiny ad in the Miami Daily News, on March 19, 1949 announced that WTVJ, Florida's first TV station, would begin broadcasting two days later. The News printed a special section full of news about the new medium on March 20, 1949. 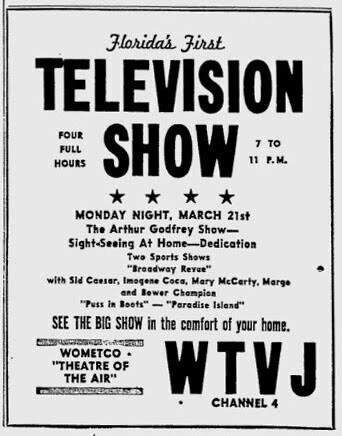 The lead story revealed that WTVJ was the first TV station in Florida and the 58th in the country. The story also cautioned readers that "today's television set is not a perfected unit." But added that with proper installation "will reproduce pictures clearly with only a few moments of interruptions." 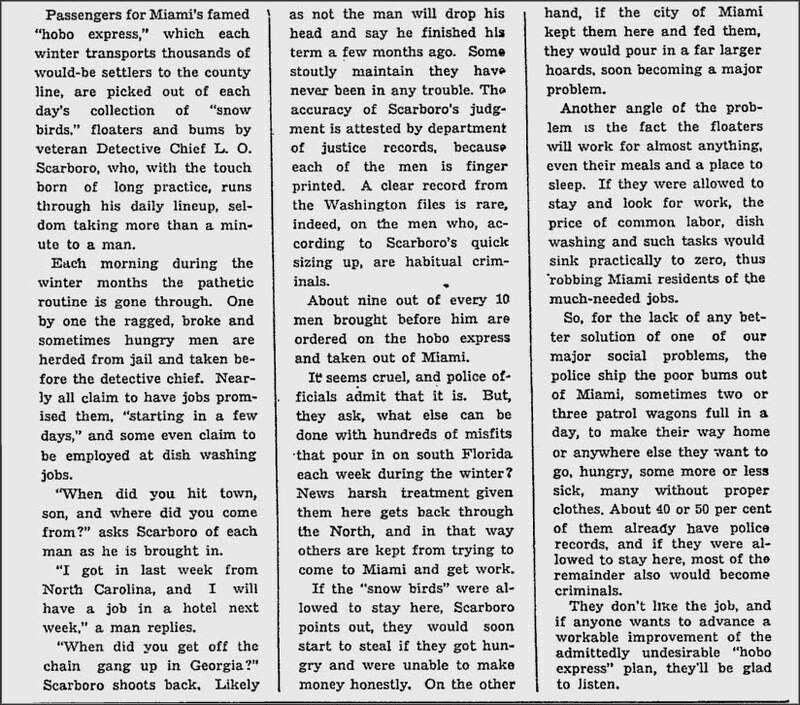 Back in the late 30's, Miami cops had an effective, if not altogether politically correct way of dealing with the thousands of homeless men that found themselves in South Florida during the winter months. 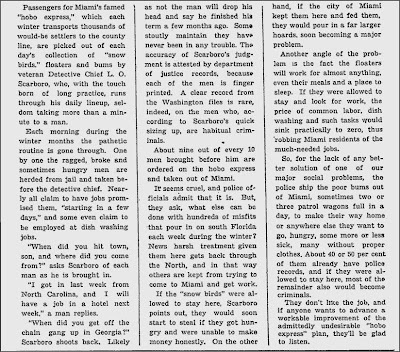 The Miami Daily News wrote about the practice in 1939 in a story titled: "'Snow Birds' Major Social Problem." 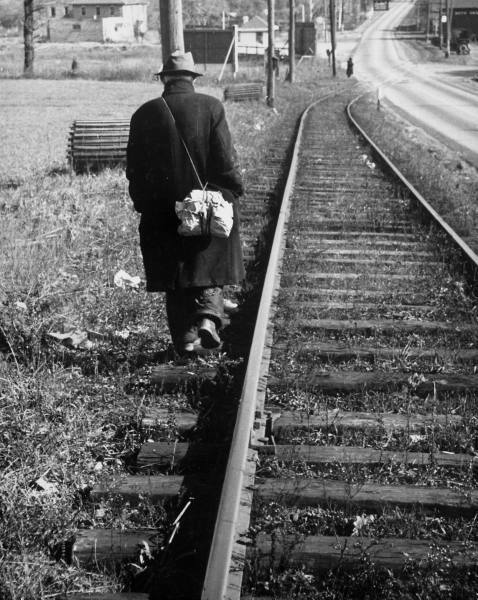 The solution to the "problem" involved rounding up the "snow birds" and putting them on the "hobo express" - a paddy wagon that had one stop: the county line! There's some bad news for drivers on South Beach who regularly press their luck by running red lights. According to this blog post on the Miami Herald's web site, Miami Beach's red light cameras went operational at nine intersections citywide last Thursday, April 15. More and more cities nationwide are turning to red light cameras for several reasons. The number one reason is they raise money for cash-strapped city governments. They also work 24 hours a day and you'll never catch one taking a coffee break at a donut shop. The Dangerous Intersection Safety Program’s camera system is synchronized to the traffic signal using non-invasive detection equipment. The camera system only photographs a vehicle if it enters the intersection after the light has turned red. A second photograph is taken as the vehicle progresses through the intersection. Vehicles that enter intersection on a yellow light phase are not photographed; even if they are still in the intersection when the light changes to the red phases. The technology is designed to record motorists as they enter an intersection after the signal turns red. The camera photographs the vehicle from the rear – not the driver. The camera records the date time, lane, location, and speed of the vehicle. This information is included on the Notice of Infraction and is then evaluated by specially trained members of the Miami Beach Police Department to verify that an infraction has occurred and to determine whether a Notice of Infraction should be mailed to the registered owner of the vehicle. What the Herald story or the city's web site don't say is that Miami Beach cops can still write tickets at all of those intersections if they witness a violation. One Miami Beach traffic enforcement cop told me, "If I see someone run a red light, I'm writing a ticket." And he says, "It's up to the driver who receives a mailed ticket in addition to my written ticket to prove that he or she was ticketed by an officer." If you feel you received a notice of infraction erroneously or if you have a legal justification for going through the red light, you may contest your violation on an appeal hearing. On the back of your notice of infraction are instructions for filing an appeal with the City of Miami Beach Special Master. Just the hassle of that should be enough to deter a driver from running a red light. A red light violation carries a civil penalty of $125 City-mandated fine for first occurrence, $250 for the second, and up to $500 for a third and any subsequent offense. That's the bad news. 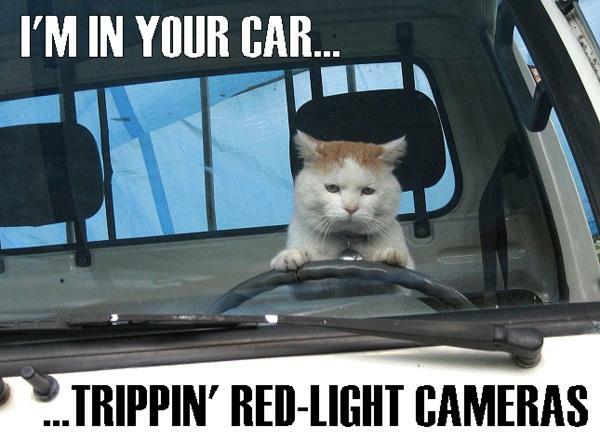 The good news is that tickets generated by red light cameras don't add points to a driver's record. But there will also be instances where someone other than the registered owner of a vehicle runs a light. The ticket will be mailed to the registered owner who has to sort it out! Several local law firms that specialize in traffic ticket cases told me today that they won't be handling red light camera generated tickets. A receptionist at one of these firms told me, "It's like a parking ticket; you don't get points." But that didn't stop former state trooper Adolph Belt Jr. from contesting a $100 ticket he got for running a red light in Springfield, MO. He fought the ticket saying "the city's use of administrative hearings to handle red light camera violations is in conflict with state law." The Missouri Supreme Court unanimously agreed and threw out the fine. 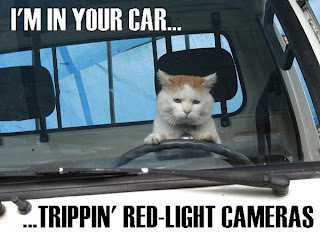 In another red light camera case - also (ironically) involving police officers - two years ago two Texas police officers contested tickets they got from red light cameras while on duty!. But if all of this sounds like one more example of government trampling on your rights or intruding in your life, my law enforcement source has a quick answer: "Just tell your readers not to run red lights!" Ten years ago this week, one of the most turbulent chapters in Miami's recent history was nearing an end. 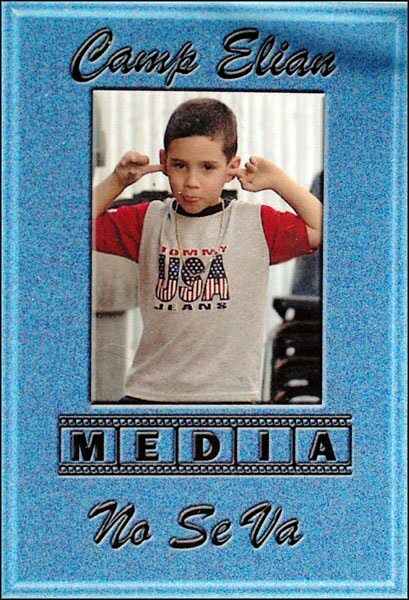 Elian Gonzalez, a fragile, angelic-looking 5 year-old Cuban boy was found clinging to an inner tube on Thanksgiving day of 1999 by fishermen in the Gulf Stream off Fort Lauderdale. Released into the custody of relatives, the boy spent 149 days in Miami before he was seized by federal agents in a violent early-morning raid on April 22, 2000. I've written a story about Elian's four months in Miami. It's a dog and cat weekend at the St. Pete Times! 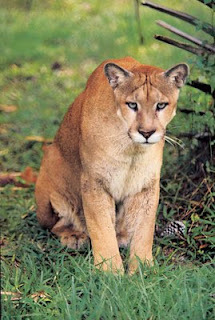 This weekend the Times is publishing the first in a series of reports by Pittman on another endangered species, the Florida panther. Pittman tells me that he's been working on the panther project for two years. The Florida panther is in worse shape than ever. Although there are now 100 of them, thanks to a bold genetic experiment in 1995, the panthers are crowded into a smaller area than ever. Officials from the U.S. Fish and Wildlife Service have never blocked any development that wipes out panther habitat, even manipulating numbers and using flawed science to justify saying yes to projects. As a result, genetic defects and other problems are now cropping up, leading to predictions that the state animal is just a dead cat walking. Click here to read Pittman's first installment on the plight of the Florida panther. Jeff Klinkenberg - Pittman's colleague at the Times - covers what he calls "the real Florida" for the paper. This weekend "Klink" has a story in the paper about Cleatis Kelly, a man who has a taste for venison. He was deer hunting in Ocala National Forest when he experienced bad luck: He got hopelessly lost. He also was favored by some good luck: The state sent a wildlife officer -- and a remarkable dog -- to look for him. Click here to read Klink's story about Bubba, the wonder dog! For those of you who may have missed my earlier post; I've launched a new blog focusing on old Miami. 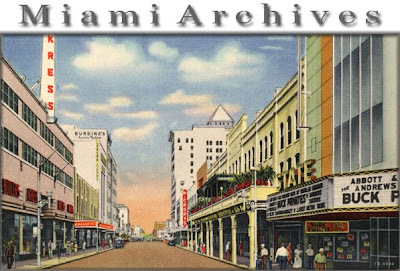 Miami Archives will look back at Miami's history relying primarily on the Google News archives of the old Miami News and other online sources. 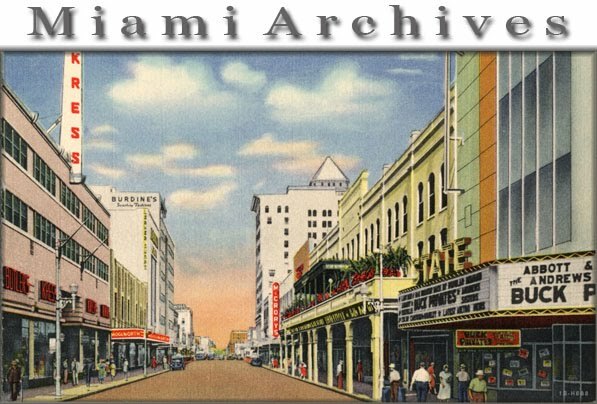 Stop by and take a look at Miami Archives. Man walking in downtown Miami wearing nothing but swim trunks causes a stir. Two cops spring into action. One calls headquarters for a ruling. He's told there doesn't seem to be a law against it. 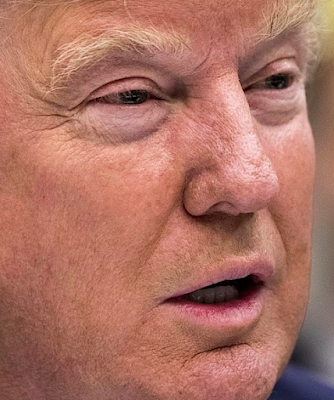 "Well, there ought to be a law," says his partner. 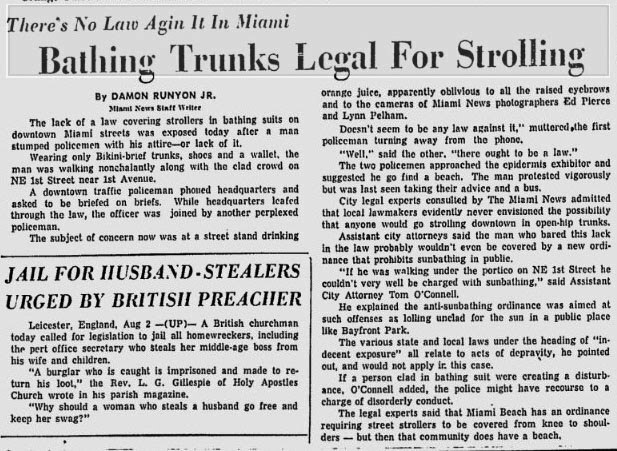 Just another day in Miami in the uptight 50's! Roots of rock 'n roll! Both of New York City's tabloids are betting today that subway riders/readers still haven't had their fill of Tiger Woods news! 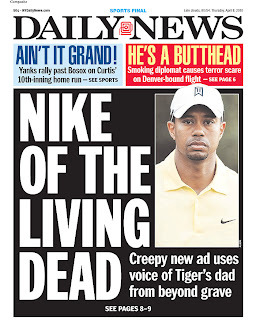 Never mind that last December, the New York Post had Tiger on the cover for TWENTY straight days. If you've lived in South Florida for any length of time, at one time or another you've probably been asked by friends or complete strangers to recommend a tourist attraction or restaurant. I know I have. Jeff Klinkenberg, a staff writer at the Florida's largest newspaper, the St. Petersburg Times, has been traveling Florida's back roads for the past quarter-century. He writes about what he calls the "real Florida" for his paper. 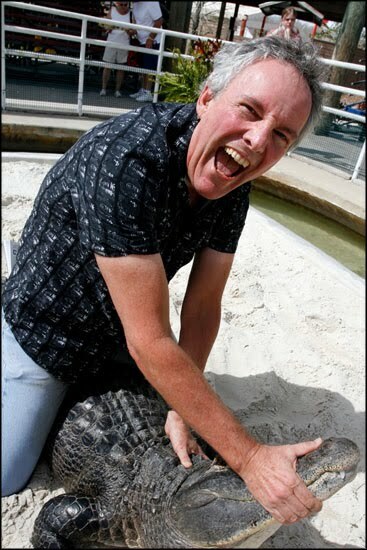 I recently asked Jeff to tell me about some of his favorite Florida places. You can read his answers here at MiamiBeach411.com. Fidel moved to undisclosed location! 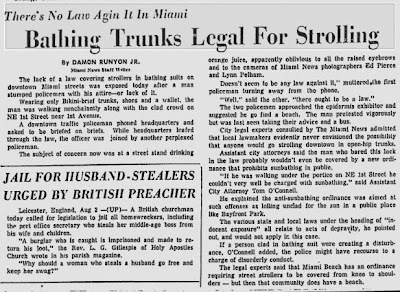 Learn more about this story on my new blog, Miami Archives. A Herald story on people traveling from overseas to the Apple store on Lincoln Road to be the first to get an iPad, is inexplicably illustrated with a slide show of pictures from - where else? - the Sony Ericsson Open tennis tournament on Key Biscayne. Panthers kick up their heels! 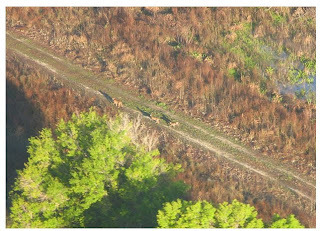 The US Fish and Wildlife Servce has posted the above photo on their Website that shows a Florida panther and her two kittens. The photo was taken in March from an airplane flying over the Picayune Strand near Naples. 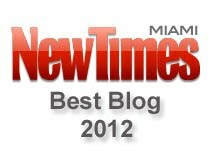 Check out my new blog devoted to Miami history: Miami Archives.